Rethinking design and making it truly green means coming to terms with the full life cycle of a product--it does die, in a sense, but where will its parts go? And where did they come from anyway? Green designers consider it all from beginning to end or, as they like to say, Cradle to Cradle (C2C) and their approach matters for all of us consumers whether we're buying furniture or going for a run. Check out what C2C means for our future. What do all of these products – the Tartan® running track at Stanford University, the brightly colored gDiaper™, Formawall™ exterior building panels at Andrews Air Force Base, Wet Women® Surf Wax, and the new Answer® system workstation – have in common? They're all certified as Cradle to Cradle™ (C2C) products, safe for both human and environmental health, and designed for easy recovery and reuse of materials. As a way to identify "green" products across a variety of industries from cleaning products to commercial interiors, C2C is an important new sustainability benchmark. C2C was introduced by McDonough Braungart Design Chemistry (MBDC), a sustainable product and process design consultancy in Charlottesville, VA, to combine all of the aspects of sustainability into one process. Its foundation is an analysis of component materials against 19 human and environmental health criteria. In addition to materials assessment, C2C measures four other sustainability criteria including energy use, water stewardship, recyclability, as well as the manufacturer's record of social responsibility. The importance of C2C is largely due to its potential to dramatically impact the environmental footprint of commercial interiors. The U.S. Green Building Council states that buildings account for 36% of all energy used, including 65% of electricity consumption; 30% of raw materials use; 30% of waste; 30% of greenhouse gas emissions; and 12% of potable water use. Embracing sustainable solutions and using C2C products can help reduce waste, improve air and water quality, conserve resources, and deliver significant health – and economic – benefits to business. Susan Pelczynski, senior associate and assistant director of interiors for Hickok Cole Architects in Washington, D.C. and a LEED accredited professional designer, believes that sustainable design can, and does, deliver measurable productivity gains for a business. "A bad workplace environment means people are out sick, they're not performing well, or they just don't want to come in to the workplace. Employee productivity is a huge factor for every business. If you can show, for example, how you can improve productivity 12% with a sustainable workplace, then that company can either hire 12% fewer employees, or get that much more productivity. You can make that case, if your client is willing to make the investment." More and more clients are willing to make the investment, and even make sustainability a priority in their projects, says Nicolette Brandstedt, resource director at the Gensler office in Chicago. "Most of our clients are educated about sustainability, and we always bring it up to them on a project. But a lot of them bring it up to us." Clients raise the same issue with manufacturers. Nearly 85% of Steelcase client proposal requests have an environmental component today compared to just 40% two years ago. The questions are getting more sophisticated, too, as customers frequently ask about specific materials, or how particular chemicals are used. To provide meaningful answers to sustainability questions, the C2C process analyzes a product's component materials down to the molecular level. "We do a deep dive into every material that goes into a product, as well as the materials used in each production, assembly and shipping process," says Jay Bolus, executive vice president of benchmarking and certification for MBDC. Since few manufacturers are vertically integrated, tracking down the materials in every last nut and bolt of a complex product means researching multiple outside suppliers of raw materials and OEM parts. One of the biggest hurdles to achieving C2C certification comes from a seemingly innocuous material known as polyvinyl chloride, or PVC. Globally, more than 30 million tons of PVC are produced each year, with over 50% used in building construction. In the contract furniture industry, PVC coats wires in panel electrical systems, forms the edge band on laminate worksurfaces, and is used in a broad range of other applications. It's lightweight, easily shaped, and relatively inexpensive. 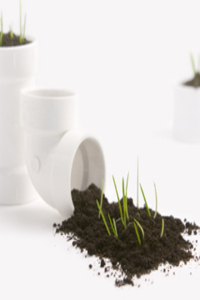 In recent years, though, PVC has become a source of global environmental concern. As PVC production and use have grown, so too has a body of scientific evidence that points to the potential long-term human and environmental health dangers of the material. In response to the research, MBDC has determined that no PVC can be used in any C2C certified products. Engineers at Steelcase found a non-PVC-coated wire for the Answer C2C workstation, and replaced PVC-banded laminate worksurfaces with wood worksurfaces. The switch to wood increases the price of the workstation slightly. But in addition to its sustainable properties, wood offers users both aesthetic and performance benefits. sustainable by design, or by legislation? The growth in sustainable product design, and green product specification is, in part, being driven by legislation. "Many state and local governments are creating new requirements. The state of Massachusetts now asks for sustainability information in their purchasing process," says Bolus. But many designers aren't waiting for legislation. According to the 2006 Design Giants Survey by Interior Design magazine, specification of sustainable products is up 47% from just three years ago. Of the firms surveyed, 100% expect to specify even more green products in the coming year. Yet before they can specify products, designers need to understand sustainability, and that takes time and usually a do-it-yourself approach. "You have to wade through what's green-wash and what's the truth," says Brandstedt at Gensler. "You have to be educated, attend U.S. Green Building Council events, ask for white papers, independent studies, and third party certifications." Newly designed sustainability standards help designers sort out sustainability claims and concerns. The LEED Green Building Rating System™ is perhaps the best known. Accepted as the green standard for the built environment, LEED is having a significant impact on design and real estate communities in North America, and increasingly, around the world. C2C certification is an ideal complement to LEED. As LEED emphasizes the broader building process and the building itself, C2C emphasizes the material characteristics of products that compose the building, or occupy it. By adding criteria related to water stewardship, energy and social responsibility in the production process, C2C gives designers assurance that in addition to getting a sustainable product, they are getting if from a an environmentally responsible company. “We pursue Cradle to Cradle certification of our products because it's a rigorous, holistic approach. It also best mirrors our environmental aspirations and business philosophy," says Nahikian. Accordingly, Steelcase plans to have C2C solutions for all of its major systems products by the end of 2007. "I think most designers consider their work to be a social contract with the user," says James Ludwig, director of design at Steelcase. "We'd all prefer to use sustainable products. But materials are the hard part. What's available? How do I know it's really a green product? And what are the materials that go into it?" C2C is one certification process that helps designers understand the makeup of the products they specify, but Ludwig sees it as more. "It's a philosophical approach, a way of solving design problems. Regardless of the certification, it's about sustainable behavior, and that's the way we should approach things as designers." Individuals drive change, of course. Bonda recalls a situation when her daughter repainted her home's interiors a few years ago. She told her daughter, "I want you to use low-VOC paint, to protect your lungs and the lungs of my grandkids." The house painter, however, argued that low-VOC paints were harder to work with and didn't cover as well as other paints. "That was debatable then, and it's certainly not true anymore," says Bonda. "But at the time I said, 'let's just say your painter's right. What's important here: your painter's happiness or your children's health?'" From the paint on the living room walls to the interior furnishings of a multi-story building, individuals making sustainable choices can make a huge difference.